Red is the Color – Tomato Town organically grows heirloom tomatoes in the greater Kansas City area as well as Johnson County, Leawood, Lenexa, Olathe, Shawnee, Merriam KS, Independence MO and Kansas City Missouri, KCMO. Varieties include: Cherokee Purple, Brandywine, Stupice, Carbon, Black Krim, Black Cherry, Yellow Pear, Absinthe and Aunt Ruby’s German Green. Farmer J and her mother have an ongoing, friendly competition over who hosts the first red tomato of the season. This year, the award goes to her mother with not one, but two Jet Star tomatoes. 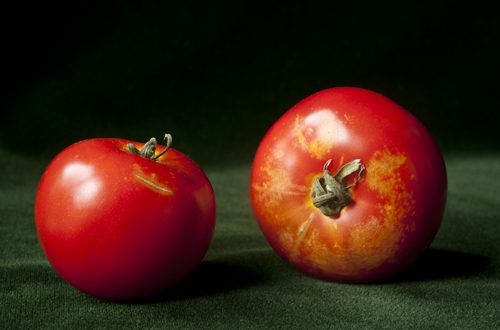 They were picked blushing on June 6th, and photographed fully ripe on June 11. This is a record for Farmer J’s mother, who has been growing tomatoes in her backyard for some 40 years. This entry was posted on Monday, June 11th, 2012 at 12:34 pm. It is filed under Latest Posts, Spring Posts. You can follow any responses to this entry through the RSS 2.0 feed.